Hi guys, I’ve been trying to replicate the voxelization effect I had seen many times, so finally came up with this simple script. The idea is to increases a mesh resolution -at least where needed- and then snap all its vertices to a spatial grid. This may not be the smartest approach but I got pretty decent results. Then the script removes everything but a clean vertex cloud, and dupliverts a small cube on it. The people at blenderheads.org thought in animating this, that’s why there is a second script that also supports animation through enabling and disabling object visibility. A pre animated object is baked on each frame -it can be a mesh with modifiers or even text or curves- and the resulting mesh is processed. A material and a group are created for each object. Suggestions to improve are welcome. i wish there’s a way so the cubes can inherent the colors from the texture/material. was planing to make a script like this in the future, but was busy with some commercial projects. edit: how did you make these seamless cracks? That is one cool script. Just spent an hour playing around with it. I’m going to have fun with this one. Thanks! wow! this will sure be useful for mograph. As Dhia said, the next step would be to have a way to automatically give the cubes a color. Maybe with vertex color interpolation or by texture. That’s really awesome! Great work and please keep on working on your script. It’d be great to have this as an addon or a modifier with parameters. Did you do all the mathstuff yourself? If yes, well done! Hi, there’s not really much math in here, it was more a brute force thing but it works pretty fast. What I also liked in this little project is the visibility animation system, I enjoy those icons flashing in the outliner when scrubbing. The materials support is something I will try some of this days, but I’m afraid it will flicker a bit. The current implementation is based on Blender’s dupliverts, so there is just one object -the voxel cube- replicated hundreds of times. This is very efficient but does not allows to use more than one object or material at a time. What you can do is split / separate the mesh -or maybe use the mask modifier- before processing, so you’ll end up with two or more objects. 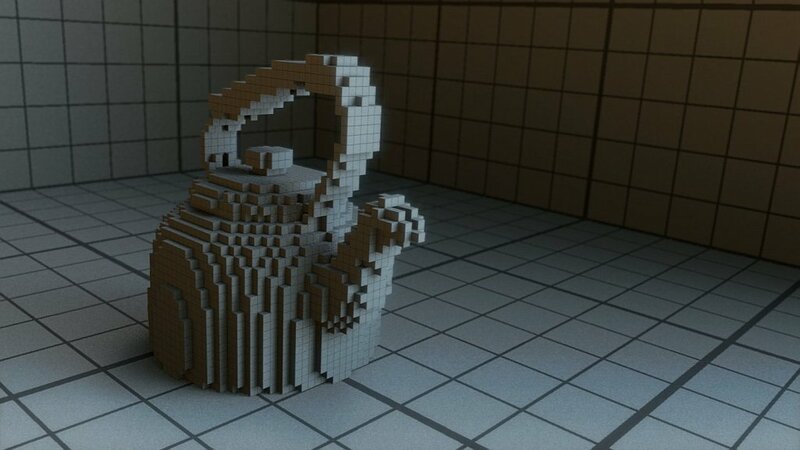 do you know http://blenderartists.org/forum/showthread.php?t=61174&highlight=Pixelate3D ? what is the difference between yours and that one? Nice, is this script for 2.56 or for 2.49? One big difference is the ability to add it to animations. Really incredible stuff; I need to post an example… give me a week to catch up on another project first. Really nice - I’m going to have to download this one. But you should make it inherit the Material / Texture of the original mesh, if it doesn’t do that already. That would make it perfect. @MaAaXx the script seems to work ‘ok’ here, see it is not an addon, you need to select an object and run it from a text editor window. @benu looking forward to see some pic or even better some animation test! Air purifier - tips and trics! look in console… sure i understand what is in the console. I used a cube. I got a second cube a new cube every time I run script. Just do not know what to do now. Please try this: on a clean file delete the cube and add a Suzanne, scale it up a bit and in a text editor window open or paste the first script. With the monkey selected run the script (Alt+P) and you are done… you can now search for the cube inside the dup object, rescale or bevel it or add a material. with small resolutions -up to 50 cubes- you can just try the particles in grid mode and a cube as the rendered object, you’ll get two modes to play with, surface and volume. if you take the time to generate a 3d grid -a vertex and some array modifiers- you can even use a modifiers stack, with a subdivide and a shrinkwrap in nearest vertex mode to create the dupliverts mesh. Wow Thanks. I do not know why the city generator showed up there. I was using it in 2.49. I got it/ 3d pix to work in one of my builds ( It very well could have been operator error ). Its the simple that confuses me. Ill make a simple shape animation now.